In the early 1980s, Redgate was particularly interested in northern European art. 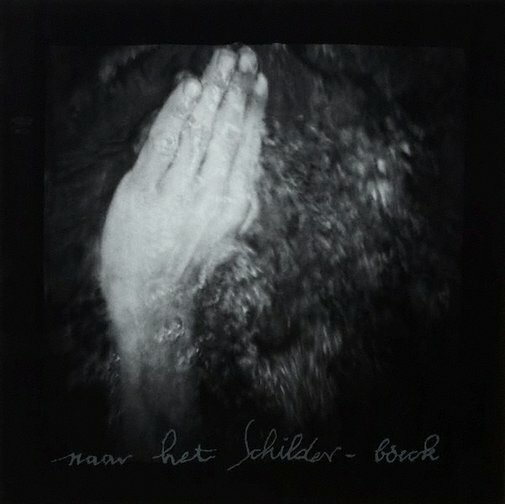 The title of the series of six photographs ‘Naar het Schilder-boeck’, meaning ‘from the book of painting’, is sandblasted onto the glass on the works in a stuttering script which looks handwritten and from another era. The title refers to the medieval and Renaissance source books of symbols and subjects for art, systems through which painters could find a suitable iconography. The source for Redgate’s series is a painting by Pieter Bruegel from 1559 known as ‘Netherlandish proverbs’ or sometimes ‘The blue cloak’. This painting is an extraordinary visual compilation of close to 100 proverbs illustrated through scenes of human and animal folly, the exact number unquantified due to the overlapping meanings of different scenes. While Bruegel’s painting has provided inspiration for Redgate’s photographs, she has not directly restaged or replicated episodes from it. ‘The world turns on his thumb’ replaces the nondescript arm of Bruegel’s male courtier with a feminine hand in pre-modern dress. It also displaces the orb, sending it spinning into a new background of tangled tree roots. ‘He fills in the ditch after the calf has drowned’ displays with grim solitude a decapitated calf’s head reminiscent of Goya’s dog buried to its neck. ‘He swims against the stream’ takes the hand that Edward Colless (in the 1988 essay ‘Tradition: Jacky Redgate’ featured in his book ‘The error of my ways’) saw ‘wav[ing] benignly, almost incidentally’ in the Bruegel ‘and plunges it through an unfathomable fluid that has overwhelmed the photographic space with its dark volume’. Colless claims that these differences in inflection and expression cause the ‘proverbial utterance to drift away from their didactic motivation’. Redgate’s images in this series are all close-ups and the human, when present, is reduced. There is no spatial depth; the dark void from which the objects and forms emerge adds to the enigma of these photographs. Jacky Redgate immigrated to Adelaide from England with her family at the age of twelve. She has a BFA from the South Australian School of Art and MVA from Sydney College of the Arts. She currently lives in Sydney and lectures at the University of Wollongong.